Many people will get depressed at some point in their lives, and this may be related to major life events such as bereavement, stress, abuse or illness. Depression may also occur for no apparent reason. Specialist help is needed if depression does not resolve spontaneously. Depression is easily missed in people who have social and communication disabilities, although it is probably more common in people with intellectual disabilities and people with autism than in the general population. In people with Down's syndrome depression may be misdiagnosed as dementia, or may be associated with underlying physical disorders such as hypothyroidism. Ron is a thirty nine year old man with a busy social life who is known by everyone in the local community as an outgoing, good humoured person. He has Down's Syndrome and moderate intellectual disabilities. He lives at home with his parents who are both in their seventies. They have noticed a gradual decrease in his skills over the past month or two. They have reported that his memory is not so good and he is more forgetful - so much so that they have to remind him about his usual activities. You are: Ron's general practitioner/community nurse. You are asked to do a home visit as he has now taken to his bed and is refusing to eat. When you check your notes you realise that you have not seen Ron for several months. You review the common medical conditions associated with Down's Syndrome. You know that people with Down's Syndrome age prematurely. Now consider what further information you need to make a diagnosis.When you visit Ron, his parents tell you that he had been attending the local day centre, and one day a week had been studying money management at College. About two months ago, Ron started to refuse to go to the centre and to College. He has also stopped going swimming, which has always been his favourite hobby. There have been several changes of staff at the day centre. Ron's aunt, his mothers' younger sister, died from cancer about six months ago. Observation of Ron's appearance and behaviour, in particular his sad facial expression, generally sad demeanour and possible tearfulness, become helpful clues to his mood. Anne is a 23 year old woman with severe intellectual disability and autism. She lives with four other women in a staffed group home in a quiet residential area 20 minutes from the centre of a large city. On her good days, Anne will greet you with a warm smile. On her bad days , which are frequent, Anne may well swear, spit or ignore you. Her key worker, Frank, has known Anne for the past year and a half. He feels strongly that the medication prescribed for Anne has little effect on her frequent mood swings, and results in unpleasant side effects. Frank holds a dim view of the health professionals involved in Anne's care. The manager of the house, Paul, is leaving in a few months time. Anne is very fond of Paul, having known him since she moved to the house 3 years ago. Paul is a gentle personality, who feels awkward about leaving and finds it difficult to talk about it, particularly as the Housing Association have not yet found a successor to his post. Paul also knows about Anne's past history of loss, including her mother leaving the family for good when Anne was 6 year's old. There was also suspicion that she had been sexually abused as a child. Anne can express herself verbally but is not a reader. She often finds understanding events over time confusing. Her favourite activities include relaxation, dancing and singing, and going out with someone she likes. Draw up a network of all the different people/services that could contribute to Ron's or Anne's care. This might be done in the form of a diagram. For Ron's and Anne's perspectives, think of any other people/services/organisations that are not family, health or social care providers who might be able to offer them support. What other actions will you take? Communication difficulties may make it harder for someone to describe changes in mood. Depression is easily missed in someone who shows autistic social and communication difficulties, particularly if the person cannot communicate their feelings of low mood (Lainhart and Folstein, 1994). But even when spoken language is minimal or non-existent, there are ways of helping people to recognise and express their feelings. First it is advisable to have as accurate an idea of the communication strengths and needs of the depressed person as possible, and a specialist speech and language assessment may help. Then you can use personal photographs, signs and symbols e.g. from the Makaton Vocabulary, drawings, cuttings from magazines and specialised resources such as the book 'Feeling Blue'. This can help someone better understand their condition and empower them to make informed choices about treatment. Also see 'Going to the Doctor' - a picture book which models good practice in the medical consultation. Click here for further information on Feeling Blue and other Books Beyond Words. Many people who have experienced severe forms of depression say they can feel overwhelmed by their black moods, whilst others suggest depression is like having intense physical pain. It is much more than just feeling a bit low. Depressed people lose their zest for life. Favourite pastimes lose their appeal. Everything seems an enormous effort. Lack of energy and constant tiredness are frequent features. These symptoms are found in depressed people with mild intellectual disability. They are more difficult to identify in people with greater degrees of intellectual disability, but there is no reason to suppose that the subjective sense of fatigue and loss of interest are not felt too. The common depressive symptom of fatigue is not under the depressed person's control, and may lead to a visit to the GP. There may be a tendency to complain of physical aches and pains too. As people with intellectual disability may have undiagnosed physical health problems, it is important for the GP to exclude any physical causes for the lack of energy first. Carers and friends may find their lack of enjoyment difficult to understand or be sympathetic about, particularly when there is no obvious cause for the depression. Anxiety is frequently part of depressive illnesses, and may include fearful feelings and thoughts and associated bodily sensations (sweating, dry mouth, nausea, palpitations, frequency of urination, etc.). Carers may find that constant reassurance seeking, restlessness and agitation are more common. Agitation, screaming and shouting have all been described particularly in depressed people who have more severe degrees of intellectual disability. These behaviours may be used to avoid doing something which the person is anxious about. The things we avoid become harder and harder to do, and as time goes by, we avoid more and more things. Obsessional thoughts and associated compulsive behaviours can appear for the first time in depression. Repetitive behaviours can also worsen during a depressive illness, including self-injurious behaviours . Changes in the way depressed people think are called cognitive features, and include poor concentration, difficulty with making decisions, tendency to self criticism, feelings of worthlessness and self blame and, in severe cases, suicidal thoughts and suicidal behaviours. Loss of self confidence and self esteem are hallmarks of depressed thinking. In severe depression, the rate of thinking is slowed down, as are body movements, leading to a state described as psychomotor retardation. Sometimes, the depressed thoughts become so extreme that they are described as depressive delusions, and may also be accompanied by hallucinations (such as "hearing voices" or "seeing visions"). Examples of a depressive delusion are the belief that one's own internal organs are rotting away, or the guilty belief that one is personally responsible for a major disaster. This is called psychotic depression. It is sometimes difficult to separate the cognitive features of depression from cognitive features of the intellectual disability. The key here is to have a good description of the persons functional abilities and their profile of strengths and needs, prior to the onset of depression. Loss of skills due to the slowing down described above might be the main way a depressive illness shows itself. Self care skills, including bladder and bowel control, may require some retraining after loss related to a depressive disorder. Somatic biological features (e.g. loss of appetite and weight loss, sleep disturbance and loss of sexual interest) may occur in a depressed person., and if severe will require antidepressant therapy, supported by appropriate psychosocial interventions. People who describe the somatic features of depression often find that their mood is at its worst in the morning, and this is called diurnal variation of mood. Sleep disturbance in depression can be very variable, and includes difficulty falling asleep, restless sleep and excessive sleeping as well as the classical early morning waking. Sleep disturbance is a particularly important sign of depression in people with intellectual disability, as it can occur in depressed people of any cognitive level and is fairly obvious to parents and carers. Behavioural changes, such as screaming, agitation, self-injury, sleep disturbance and reduced communication. are common. It is not surprising to find that depression may trigger or increase certain kinds of challenging behaviours. When a depressed person cannot communicate his or her feelings, it is important to be able to describe and monitor any behaviours which may reflect any underlying depression. In two studies of depressed adults with Down's Syndrome, the commonest symptoms were: sadness, loss of interest and social withdrawal, reduced energy and slowed activity. However, many more symptoms have been described in people with Down's Syndrome. A physical cause such as hypothyroidism, viral illness or chronic pain. Depression can be confused with other medical illnesses, particularly when the predominant symptoms are behavioural changes, and certain conditions can trigger depression. It is essential to have a full and thorough physical examination when there is any doubt about the diagnosis, and to treat any co-existing physical health problems. A full response to treatment for depression has been found to be related to good physical health care. This will include minimising any mobility or sensory impairment, and actively treating endocrine abnormalities (such as thyroid disease), epilepsy and other medical and dental conditions. People with intellectual disabilities may not recognise their 'symptoms' as an indicator of illness which they should see a doctor about. Carers may not realise the significance of symptoms, or think symptoms are severe enough to warrant medical attention. Depressed people can be irritating, tiring or unpredictable to live with and carers may need practical advice and support themselves. Carers may not provide the support needed for the person to consult a doctor. Healthcare decision making requires provision of adequate information presented accessibly, and the doctor may lack the required time and communication skills. The person may be unable to describe symptoms clearly to a doctor or to give answers that a doctor needs. They may not understand about the need for examination, and may not co-operate. 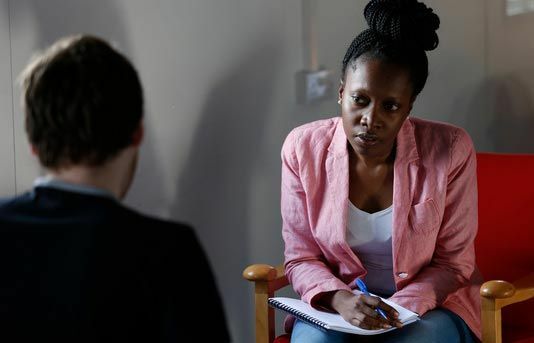 They may be offered different treatment from other people with the same condition, because of difficulty in obtaining consent, or because of untested assumptions about how they would co-operate or react to treatment. Treatment intended for short-term use may not be reviewed, because the carers may just request repeat prescriptions. major illness or a chronic painful condition. Individuals vary in their perception of events as threatening or as emotional losses, so it is necessary to carefully explore with the person the meaning to them of any event which could be experienced as a personal loss or threat. These events are called life events. There is good evidence that people with intellectual disabilities are more at risk of experiencing adverse life events. A whole person approach is used in treatment. Interventions need to be tailored to suit each individual, and should therefore be preceded by a careful assessment of needs including biological, psychological and social aspects. Depression which fails to get better may suggest that an unsuspected additional factor is maintaining the illness. For example, for one person a simple change in his/her lifestyle or care arrangements may be all that is required, whereas for another, counselling by a health care professional or specialist psychotherapist may be necessary. In Ron's story his G.P. comes to assess him at home. She decides to offer him counselling herself. In others, antidepressant medication may be needed in addition to cognitive or psychodynamic therapy. Effective treatment of the depression will also reduce any associated anxiety, obsessional or compulsive behaviours, unless a reinforcing aspect to the behaviour has unintentionally occurred. If medication is stopped too soon, depression may recur (remember that anti-depressants are not addictive). A small number of people who feel suicidal will need continuous support until their suicidal feelings have completely disappeared. Mood may take 3 to 4 weeks, but even then, unwanted behaviours which originally expressed feelings of depression, may continue if they have elicited reinforcers from carers. Some people become depressed time and time again. Others have intervening 'high' (or manic) mood states between depressions, so called manic-depression or bi-polar affective disorder. For them, long-term medication may be required. Some life events can be anticipated and proactive steps taken to prepare everyone involved. The agreement and support of carers, including family carers, is important. Consent to referral and to treatment is usually necessary but carers have a duty of care which may supersede the wishes or understanding of the depressed person. Explanations can help carers to provide a more supportive environment. In some situations, the carer themselves may also need support. Video 'Chasing Away the Blues'. The video was made at St George's with the help of the Strathcona Theatre Company and has been published jointly by Pavilion and St George's in a staff training pack. Some pictures from the book 'Feeling Blue' will also be used to illustrate this chapter. Hollins S. & Curran J. (1996) Understanding Depression in people with intellectual disabilities, A training pack for staff and carers, Published by Pavilion and St George's HMS. Hollins S. & Curran J. (1995) Feeling Blue, Books Beyond Words, Gaskell Press Hollins S. & Sireling L (1999) Understanding Grief in people with intellectual disabilities, A training pack for staff and carers, Published by Pavilion and St George's HMS. Hurley A and Sovner R (1991) Cognitive Behavioural Therapy for depression in individuals with developmental disabilities. Habilitative Mental Healthcare Newsletter, l0,7,41-47. Lainhart J.E. & Folstein S.E. (1994) Affective disorders in people with autism: A review of published cases. Journal of Autism and Developmental Disorders, 24, 587-601. Bhaumik S, Collacott , Gandhi D, Duggirala C, Wildgust H (1995). A naturalistic study in the use of antidepressants in adults with learning disabilities and affective disorders. McGuire D and Chicoine B (1996). Depressive disorders in adults with Down's Syndrome. The Habilitative Mental Healthcare Newsletter, l5, l, l-7. Moss S, Patel P, Prosser H, Goldberg D, Simpson N, Rowe S and Lucchino R. (1993) Psychiatric morbidity in older people with moderate and severe learning disability. I: Development and reliability of the patient interview (PAS-ADD). British Journal of Psychiatry. 163:471-80. Ryan R (1994). Post Traumatic Stress Disorder in persons with developmental disabilities. Community Mental Health Journal, 30, 45-5.